Don’t feel bad to leave your furry friend at home while you enjoy the fresh air while riding your cycle. Pets always love to out and have fun but leashing your pet with the cycle is the most unsafe way. No need to worry any more, get the new Solvit Hound Pet Bicycle Trailer and carry your best friend along with you in the fun ride. You can even carry your big pets in this and one of the biggest advantage is that while not riding it can also be used as a crate to keep the pet inside. Isn’t it nice, so get rolling with your best friend with the new Solvit Hound Pet Bicycle Trailer from Amazon and you can avail the offer of 50 Dollar as cash back with Amazone.com reward visa. Using a pet bicycle trailer is the safest option to carry your pet along with you in the fun ride as leashing them with the cycle is dangerous for both of you. Rugged 600d polyester with waterproof floorboard is used on a steel frame to make this. A zippered mesh screen layer at the front door and a zippered vinyl windscreen is used to restrict wind and bad weather. It is the safest place to keep your pet in after your home. You pet can easily enjoy the view with the open top. You can easily carry your large pets in this; the maximum carrying capacity is 110 lbs, so there is nothing to worry for the capacity. 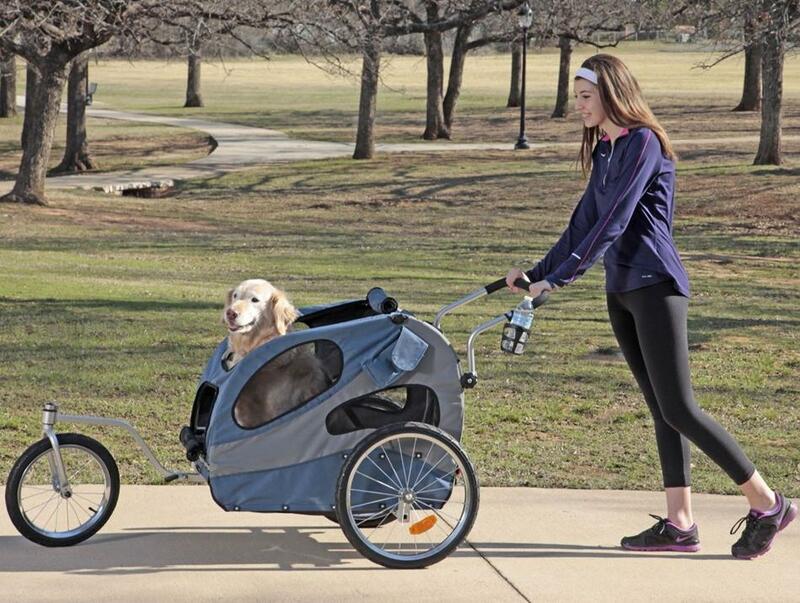 You can even take your old pet or having any kind of mobility disorder in this and let it enjoy the fresh air. For attachment and assembling you do not need any tools. It can easily be done with bare hands. With an extra safety strap you can even carry to dogs in this. Solvit Stroller adapter kit easily transforms the bile trailer to a stroller. The Solvit Hound Pet Bicycle Trailer is available in different sizes and has different capacity level, so check the maximum allowed weight before buying the same. It is a kid’s job to assemble and fold down for easy storage. With few simple steps you can easily tow the trailer to your bike. You can get extra trailer hitch for your bike or the trailer to tow in multiple bikes. It’s a smooth ride for the furry friend of yours with the Solvit Hound Pet Bicycle Trailer, he will cherish every moment of his life he spent in the trailer. It also has a open roof which allows your friend to peek outside. All kind of safety accessories like safety leash, comfortable and washable seat etc are pre equipped in the trailer. You can use the Solvit Hound pet bicycle trailer for multiple uses like you can use it to carry your pet as a trailer and even with few simple adjustments you can also use it as a stroller. At home you can even use the trailer as a crate for carrying the pet or as pet home. The safe enclosure will always keep your pet safe and sound. It is made up of rugged 600 d polyester with waterproof floorboard. The steel frame makes it sturdier. The door and windscreens are of mesh screen layer and vinyl windscreen, offering an all around protection from weather. It has open roof which add more fun to the pet. It is very easy to assemble and store. It can be hitched with any of the bicycle with the help of the universal bicycle hitch. The adjustable safety leash provides extra safety to the pet. Some face issues with assembling but there are various video clips and tips to guide. It is one of the best tools to increase the bond between you and your best friend. 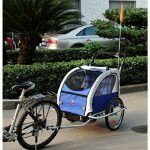 You can carry any kind of pet in the Solvit Hound Pet Bicycle Trailer like cat or rabbit etc but make sure to leash them safely; however, it is mainly used to carry dogs. Our pet needs our support and help at their difficult times and even when they are healthy they just hate to stay alone at home. So enjoy the fun ride with your best lad with Solvit Hound Pet Bicycle Trailer from amazone.